You may recognize the word ‘taurine’ from seeing it on the label of many different types of energy drink cans such as RedBull or Monster, but what is taurine and what does it do for your body? First, contrary to urban legend, taurine is not derived from the testicles of a bull or from the urine of female cattle. It was simply first found in the bile of a castrated bull and so the name ‘taurine,’ from the Latin word for ‘bull,’ ‘Taurus,’ came about. Taurine is actually a non-essential amino acid that is naturally produced by your body and is the most plentiful amino acid in many tissues. Unlike some amino acids, it’s not found in muscle protein but is important to your body’s metabolism and essential to the functioning of your central nervous system, skeletal muscle, heart and brain. 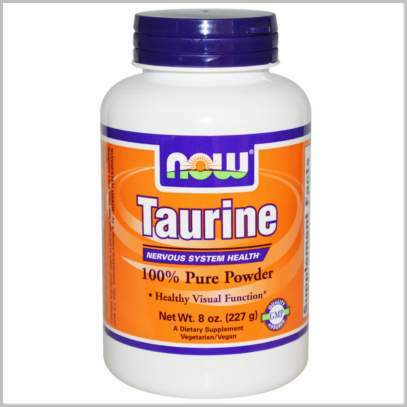 Taurine also provides metabolic functions to your gall bladder, eyes and blood vessels. It aids in the breakdown of fats and aids and in the absorption of vitamins. It is the key ingredient in bile which is needed for fat digestion, the absorption of fat-soluble vitamins, as well as controlling the cholesterol levels in your body. It is thought to also have antioxidant properties. The research is inconclusive in many instances, however there are some indications that taurine may be effective in treating the following: autism, Down Syndrome, high blood pressure in adults, diabetes, breast cancer, and bipolar depression. Body builders and athletes may combine it with creatine to reduce muscle fatigue and soreness, as well as to improve exercise performance. It could also treat anxiety, hyperactivity, poor brain function and epilepsy. Taurine and zinc are needed for eye health and vision. Some studies at the University of London found that taurine could actually minimize liver damage and ward off a hangover. However, the use of energy drinks containing taurine with alcoholic beverages has shown to have a whole different set of negative consequences. However, if taurine really does treat the effects of fatty liver, as well as possible keep it from happening, it could actually be the first treatment available for children suffering from fatty liver diseases due to obesity. It may also improve physical performance and, when combined with caffeine, it may improve mental performance, according to some studies, which is why it is often found in many energy drinks. It sounds almost like a miracle “drug” with so many essential functions in your body as well as so many different possible health benefits. While adults can produce their own taurine, newborns cannot. Premature infants may need to have taurine supplements in their formula in order to increase their ability to have healthy brain development but in most cases the taurine found naturally in breast milk or formula are enough. Although taurine is created naturally by an adult body, it found in many popular energy drinks is created synthetically. Adults may need supplements for a variety of health reasons. It can be found naturally in fish and meat and is also available as a dietary supplement. If a dietary supplement is needed, up to 3,000 milligrams a day of supplemental taurine is considered safe and it is recommended that it is used with B6 vitamins in order for your body to best synthesize this nutrient. Excess taurine is excreted by the kidneys, however, health care providers suggest moderation since little is known about the long term effects of heavy taurine use. DISCLAIMER: The information contained in this article is for informational purposes only, and should not be used as a substitute for personal care by a licensed physician. Please see your physician for diagnosis and treatment of any concerning symptoms or medical condition.